Corona del Mar (Spanish for “Crown of the Sea”) or CdM known as to locals, is a village in the southern portion of the affluent city of Newport Beach. Settled early in the 20th Century, CdM has no locally administered municipal government, but receives all municipal level services from the City of Newport Beach, and has a representative to the NB City Council. This quaint village is nestled on the foot of the San Joaquin Hills and fronts the Pacific Ocean The central portion of the town incorporates the Village proper or “Flower Streets” and housing tracts of Harbor View Homes, Harbor View Homes South, Jasmine Creek and Broadmoor. Residential living ranges from cottages, duplexes to large ocean and hilltop estates and fills the city with a wide array of architectural styles, price ranges and diversity. The older area of CdM consists mostly of closely spaced, free standing, detached single family houses of varying architecture, concentrated along Pacific Coast Highway (PCH). 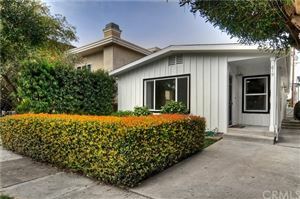 Newer developments in Harbor View Hills consist of California ranch style homes originally built in the late 1960’s. In recent years many of these homes have been completely remodeled or rebuilt into custom homes offering expansive views. Just a few block inland from the beach is the ‘downtown’ area of the village, where shops, boutiques and restaurants border both sides of the Coast Highway and the 2.2-acre Sherman Library and Gardens is known as a ‘horticultural retreat’. Corona Del Mar High School in 2011 U.S. News and World Report gave the school a silver medal, ranking it #127 of over 21,786 high schools in math and science. That same year Newsweek magazine ranked CDMHS number 172 of the 500 best high schools in the United States. Nearly 75% of graduating seniors transition directly to four-year colleges or universities, triple the average for high schools statewide. This rating was based on scholastics, athletics and school activities. The two elementary schools, Lincoln and Harbor View test rating was 10 out of 10 by education.com in 2011.